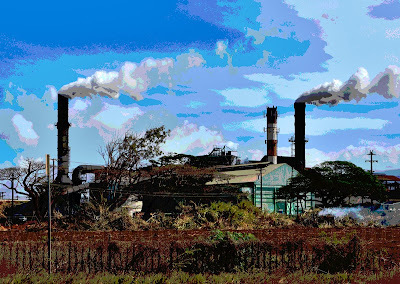 The last sugar mill on Maui continues to operate in Puunene, for now. While the sugar industry has shrunk to economic insignificance compared to tourism, it still exerts enormous political pull. Harvesting is still done in the traditional method of burning the fields of cane causing huge clouds of smoke to billow high into the sky. Not a problem, says the industry because it all blows away out to sea. The hundreds of miles of plastic irrigation pipe? According to the sugar industry it all burns harmlessly turning into carbon dioxide and water. How do we get so upset about the burning of the Amazon rain forest, but don't care about the constant and ongoing burning of huge cane fields right here at home? Oh, that's right. I almost forgot. "It is the island way."